INDIANAPOLIS (Dec. 13, 2013) – Schmidt Peterson Motorsports (SPM) has signed Racing Steps Foundation-backed driver Jack Harvey, the highest finishing rookie in Europe’s GP3 Series in 2013, to drive one of its Indy Lights entries in 2014. The 20-year-old from Bassingham, England scored GP3 victories at Silverstone and Monza in 2013, driving for the ART Grand Prix team. 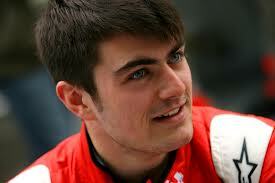 His 13 top-10 finishes carried him to fifth place in the GP3 Series Championship, one of Formula 1’s feeder series. SPM has captured seven Indy Lights titles since 2004 and is the winningest team in series history with 60 victories. Harvey got his first taste of driving in the U.S. when he tested with SPM at Sebring International Raceway in November. The Racing Steps Foundation (RSF) has guided and funded Harvey’s racing career since 2009, and was instrumental in helping him make the switch to the Mazda Road to Indy. As the 2014 Indy Lights season opener in St. Petersburg, Fla. draws closer, team owner Sam Schmidt is committed to ensuring the highest caliber talent that will help the team chase its eighth championship. For more information on Jack Harvey visit racingsteps.com and jackharveyracing.com and follow @SPMIndyCar on Twitter.